Canby boys' team dropped a pair of contests to two of the better teams in the state. On Tuesday, Jan. 22 Canby came up short against No. 22 Tualatin 62-43. They followed that up with a spirited performance in defeat against No. 1 Lake Oswego 68-49. With the loss, Canby falls to 4-6 in defense of its home court. Against Tualatin, Canby held serve through three quarters of play and trailed by just three points heading into the fourth and final quarter of play. Unfortunately, that's when Tualatin took over, outscoring Canby 22-6 in the fourth and final stanza. Part of the outcome was decided by the rebounds. Canby was outrebounded 33-22 in both offensive and defensive boards. The other edge Tualatin gained over Canby was in shooting percentage. From the field, Canby shot just 38 percent, going 18-of 47. From the charity stripe, the Cougars shot little better, going 2-of-5 for 40 percent. Tualatin meanwhile shot 51 percent from the field (24-of-57) and 53 percent from the free throw line (8-of-15). The two teams were otherwise fairly even, with each team getting four steals and 11 turnovers. Senior Rizdin Miller led the Cougars with 12 points, 7 rebounds, and 2 assists. Sophomores Tyler Mead and Diego Arredondo were next in the scoring queue with 9 points apiece. Fellow sophomore Chance Miller had 3 points, 5 rebounds, and 5 assists. In the Friday, Jan. 25 matchup with the Lakers, Canby was able to generate a few more points against the top 6A team in the state. The Cougars sank seven 3-point baskets to keep itself in the game, with Mead and Arredondo nabbing two each. The team as a whole shot 20-of-54 on field goal attempts, and was once again 2-of-5 from the free throw line. Lake Oswego showed why it is the No. 1 ranked team in the state, shooting an impressive 54 percent from the field and a 71 percent from the free throw line. The Lakers also had four players shoot double digit numbers. Compare that with Canby's two (Mead and Arredondo), and the variety of scorers made for a long night for the Cougars. Canby was once again outrebounded, but managed to get slightly more steals than the Lakers (6-5). Arredondo led the scoring effort for Canby with 14 points, followed closely by Mead with 13 points. The Cougars had seven other scorers, but no one scored over four points in the game. 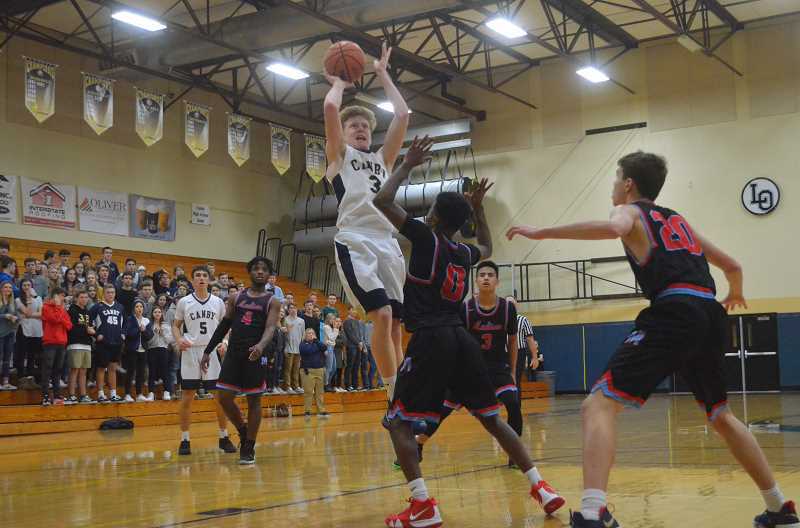 Canby (1-5 in Three Rivers League, 6-11 overall) will look to shake a four game slump when they take to the road against Tigard (4-1 in TRL play, 11-6 overall) on Friday, Feb. 1 in the second half of league play.